People are being disabled – by other people, objects, environments. We want to abolish those barriers that are existing in our minds and environment from the early age by making a first step with our inclusive swing CLOUDI. By redesigning the play equipment ‘swing’ using different materials and form, we support a child’s physical ergonomics, strengthen the body and trigger imagination during outdoor play. Diversity is an enrichment, thus we are aiming to encourage interaction between kids with disability and without. We are creating opportunities for all the children to engage in participative play by designing something that can be used independently from their physical constitution and composition. That way, we are able to start changing the lack of knowledge about the needs of impaired people. Our mission is to raise awareness about and change the negative perception of disability and develop a product so that people aren’t defined by their disablity. We found that disabiltiy is more a social phenomena. Children rarely show fears of contact and prejudice. Thus, the design of an inclusive play equipment provides an ideal opportunity to provide impact on the human mindset. CLOUDI is made to reduce psychological barriers towards people with disabilities. The goal is to build an object for children above the age of three that can be added on every playground and is inclusive as everything else on playgrounds is usually not. A bean bag or foam structure that adapts ergonomically to the body shape will be integrated into the seat sculpture of the CLOUDI. An elastic, water proof, abrasion-proof, washable coating which appeals to the tactile senses as well as a soft but resilient filling that allows to relax and feel comfortable is included in the design concept. .
By doing this, we make visible that there are benefits for both sides, the care giver and care taker. We are enabling people to connect with each other through design. 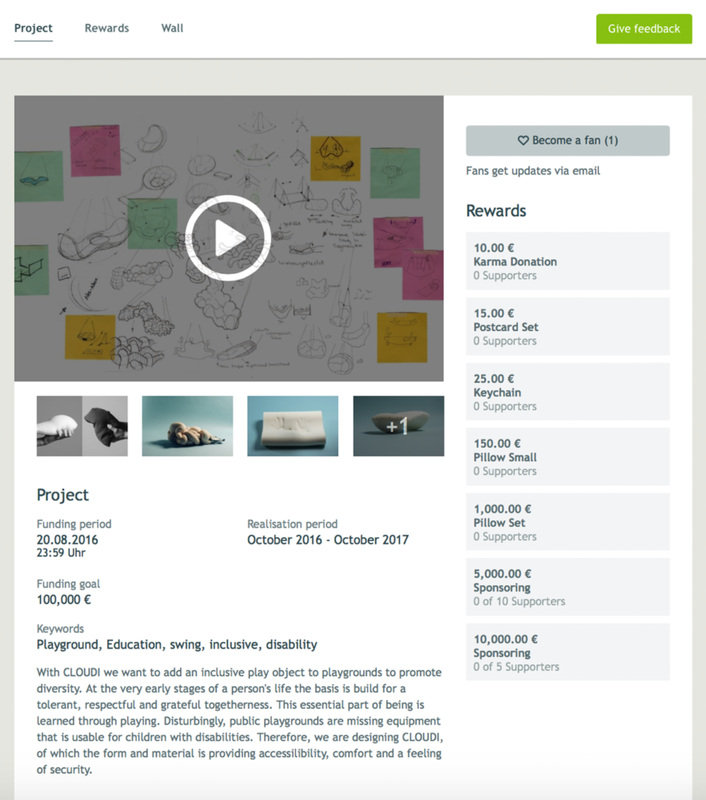 Our project is a step towards an inclusive society, by creating encounters between people with and without disabilities. We believe that everyone in the society should be able to enjoy as much of their life as they can. However, people with disabilities are facing many barriers through their life, both physically and psychologically. They are in a way sorted out of the everyday life. They are in special-needs schools, sheltered workshops, care homes. This results in prejudice and fear. The welfare state seems to has failed to provide accessibility on playgrounds. We are aiming to ensure the fundamental right of social participation to people with all kinds of impairments. So we enhance access to play by developing a play equipment: The CLOUDI swing – Inclusive by design, not by label. Help us raising awareness about barriers disabling people and support us to reduce prejudice in society! Together, we can change society’s perspective on disability.